Packed with trail-ready tools, this gadget combines a watch and Swiss Army knife components all in one design. Packed with trail-ready tools, this gadget combines seven tools at your disposal, including a watch, bottle opener, knife, screwdriver, compass, tweezers, and a toothpick all in one design. With its stainless steel case, Japan quartz movement, and luminous hands, the chronograph will keep you on track 24/7. The sleek, aluminum cobra clip lets you keep all your keys handy in the same package. Just grab it and go--you're ready for any challenge that doesn't require GPS! Designed by Marty Cooper. Made in China. Marty Cooper is an innovator and avid outdoorsman who integrates useful tools and gear into the casing of his timepieces. His family-owned watch company was established in 1945 in Cincinnati, Ohio, where it still operates to this day. My husband clips it on his duty belt. Great gift for picky dude or cool chick. My kids told me they've already needed to use the tools that come with the watch. They also like being able to see what time it is if they don't have their phones on them (although when that would be, I truly don't know). Birthday present for 15 year old grandson. I plan to buy this watch for my husband when his birthday comes around. 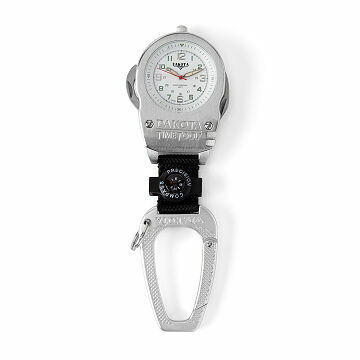 My son-in-law a solider loved this clip watch! I purchased for my son-in-law to take with him he's being deployed out of country. He loved it. Clip on watch perfect! I purchased this gift for a customer service representative at my bank who was of a great help to me. He is so kind and is always there to assist me with a big smile.